The extent to which social media can potentially add value within various service contexts is not well understood. While at a general level it would seem that direct and immediate interactive communication with customers and stakeholders would be of benefit in terms of general communications, the integration of new media alongside more traditional marketing activities is not without difficulty. Many organisations appear seduced by what new technological communication channels are capable of but evidence suggests that those same organisations may have limited sensitivity to the appropriateness of employing social media to add value to the customers’ service experience. Launching social media initiatives appears low cost and fairly straightforward, technically, but managing the subsequent interactions and engagement appropriately, and indeed profitably, can often be beyond a firm’s resources and competencies. 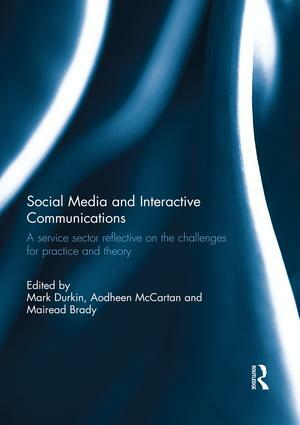 In this book the challenges of effectively managing interactive communications through social media is described in various service contexts, (e.g. healthcare, travel, small businesses) and within prevailing, yet ever more crucial marketing concepts, such as customer relationship management (CRM) and customer complaining behaviour. This book was originally published as a special issue of the Service Industries Journal. Mark Durkin is Professor of Marketing in the Ulster University Business School, UK. Mark spent over a decade in various service, sales and marketing roles with the Bank of Ireland Group culminating in the role of Group Marketing Communications Executive (NI). Mark has worked at Monash University in Melbourne, Australia, and Otago University in Dunedin, New Zealand, and in 2006 was awarded the Chartered Institute of Marketing’s (CIM) ‘Marketing Person of the Year’ in recognition of his contribution to marketing education in Ireland. He has conducted his research and presented to academic and practitioner audiences in Australia, New Zealand, Sweden, USA, UK and Ireland and he is currently focused on exploring the growing domain of digital marketing. Mark works closely with business practitioners in helping improve business practices especially as these relate to the adoption and utilisation of new technology within marketing. Aodheen McCartan is a Senior Lecturer in the School of Communication at Ulster University, UK. Aodheen’s research interests lie in the fields of marketing communication, small firm marketing and financial services marketing. A focus of her research is how technology can complement traditional communication platforms. Mairead Brady is an Assistant Professor of Marketing at Trinity College Dublin, Ireland, and is also the co-author of the popular Marketing Management textbook with Philip Kotler, Kevin Keller, Malcolm Goodman and Torben Hasen. Her research interests and publications are in the areas of technology and marketing practice, social media, data analytics and gamification.